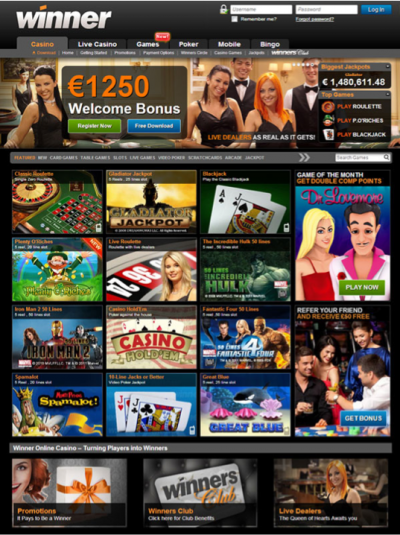 On the lookout for a new online casino? If you’re not then perhaps you should be because over time, many of the websites we once played at lose their initial appeal. Many don’t of course, such as the ones we currently recommend but opening up a new account at a new venue can offer plenty for the intrepid player. Our guides are full of advice about which casinos offer the best bonuses for new players, best customer service and so forth and in this article we’re going to tell you all about the slots available at Winner Casino because, let’s face it, it’s all about spinning those reels. Winner Casino is something of an interesting choice for us because it doesn’t feature the same enormous number of slots as Bet Victor for example. For Winner, it’s a question of quality over quantity and you will be unlikely to find a tedious or unengaging game at this website. There may only be around 140 slots but they are all from Playtech or it’s subsidiary Ash Gaming and those companies rarely hits a bum note. All the games are listed below the slider in a pleasing grid formation and there’s a handy tab above which makes it easy to pick from the newest games, the progressive jackpot games and so forth. If you know exactly which game you want to play then use the search box to the top right of the grid to head straight there. Winner Casino is an excellent choice for those looking to play the most recent Playtech releases such as Fortune Hill and The Three Musketeers, not forgetting those fantastic Marvel Slots so while there may not be a choice of thousands, it’s well worth signing up here.